11. What is the best tasting Arak for the money in Lebanon? 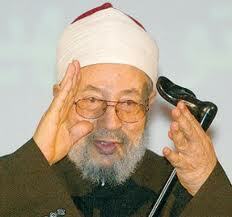 SHEIKH YOUSSEF QARADAWI, Al-Jazeera’s host of “Shari’ah and Life”. The Egyptian-born cleric and rabblerouser demonstrated vast knowledge of Lebanese hooch with the only correct answer. But like all things in life, the victory was accompanied by a dose of bitterness. That’s because the grand prize is a trip to Qatar where the fire-breathing Sheikh Qaradawi already lives! This has put SyrPer in a very embarrassing situation. Qatar airlines will not give value for the ticket nor issue another one to Thailand, Qaradawi’s favorite vacation spot. The good sheikh has vowed “massive lawsuits and retribution.” But congratulations anyway Sheikh Youssef! As a note, the correct answer to the tie-breaker question was “Ghantous-Abu-Raad” which our panel of experts deemed the “best for the money” after a long night of excess and debauchery.